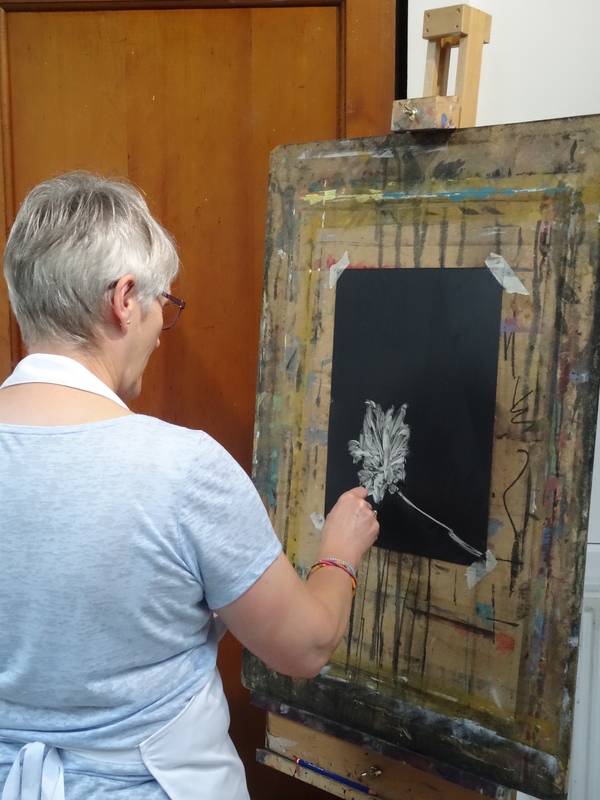 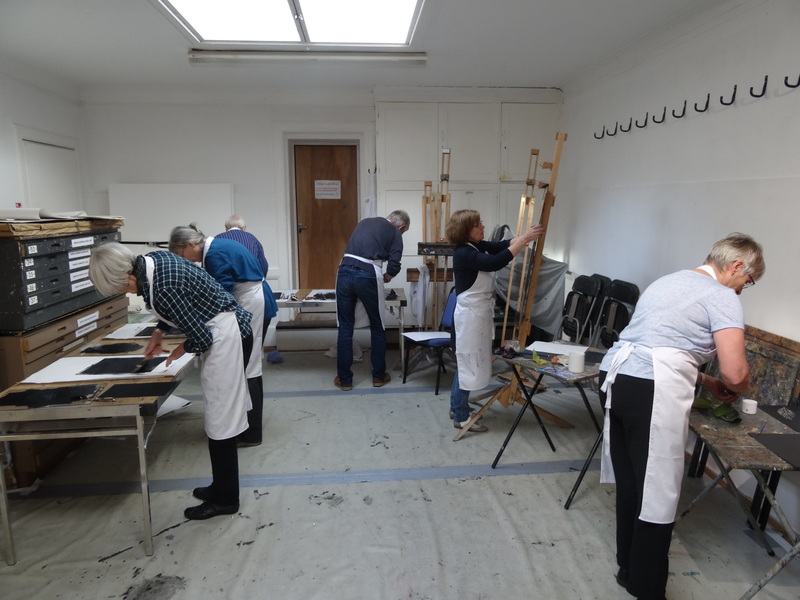 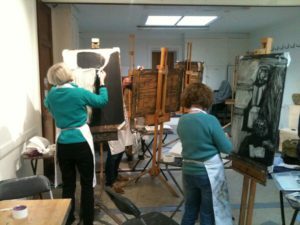 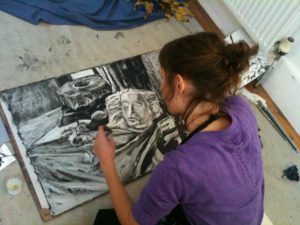 In weeks three and four of the course we have been exploring ‘Composition and Relationships’ through reductionist drawing/painting. In Week Three we added leaves to our stones, dicussing it a metaphorical symbol for autumn, the passing of the seasons and a symbol of transience. 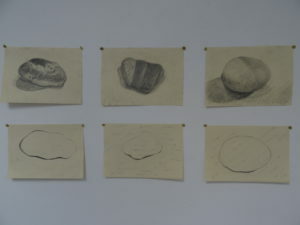 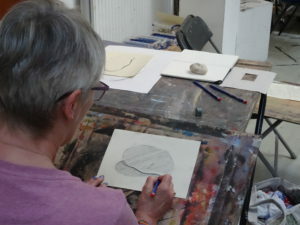 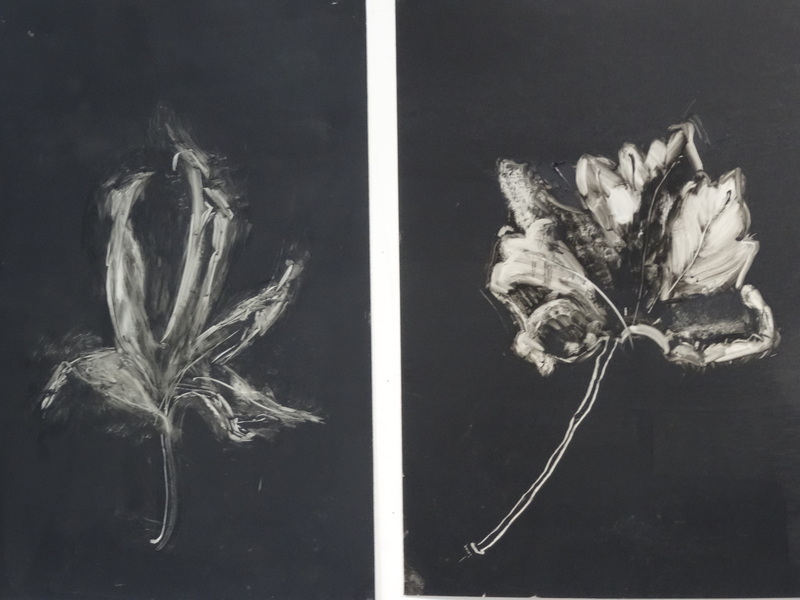 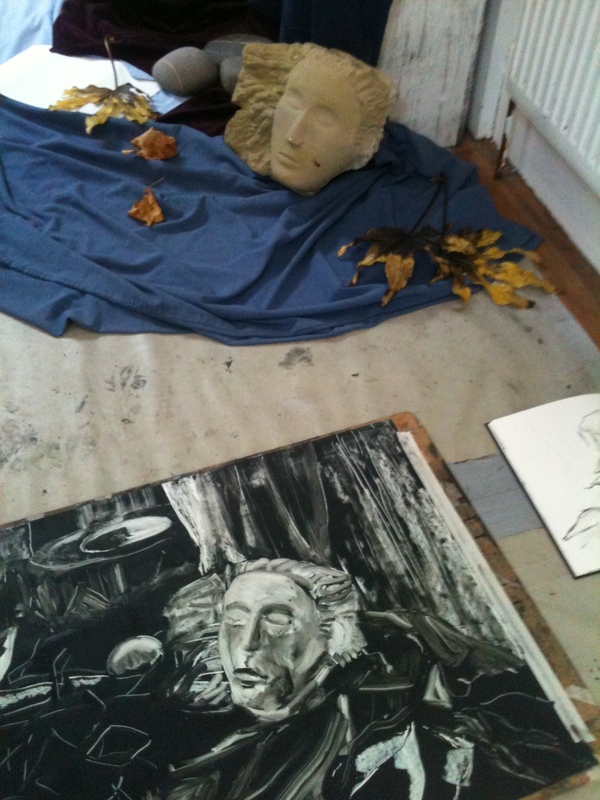 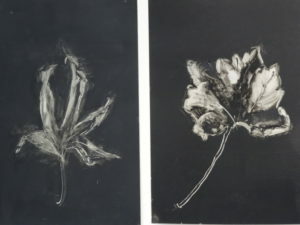 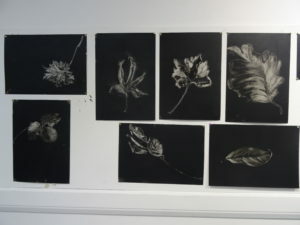 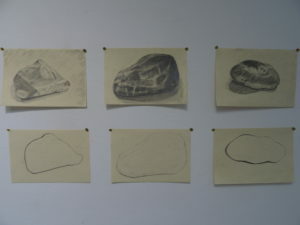 Tonal drawings of the leaf we followed by a longer drawing in the afternoon of both objects. 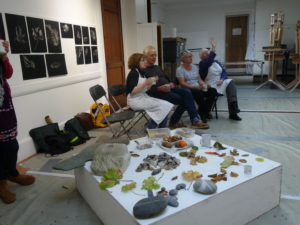 The students were to set up chose their own simple compositions combining a stone and leaf. 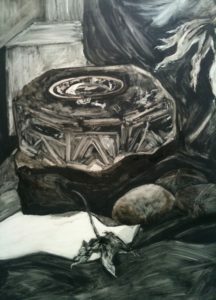 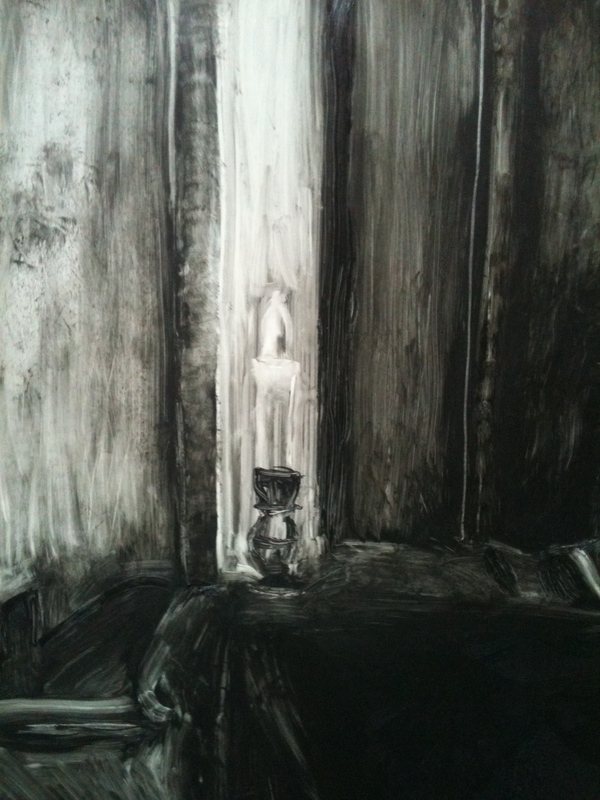 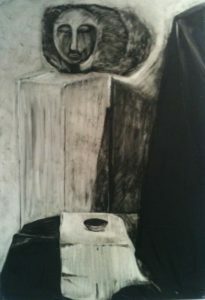 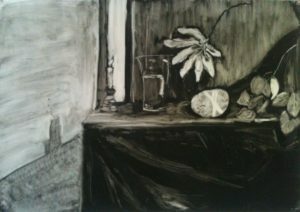 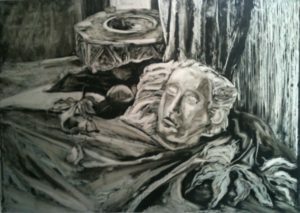 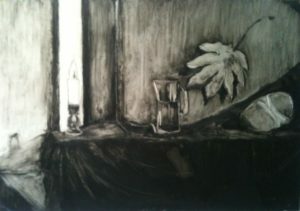 In Week Four we continued to work in the same technique, but this time working on one A1 drawing from a still life. 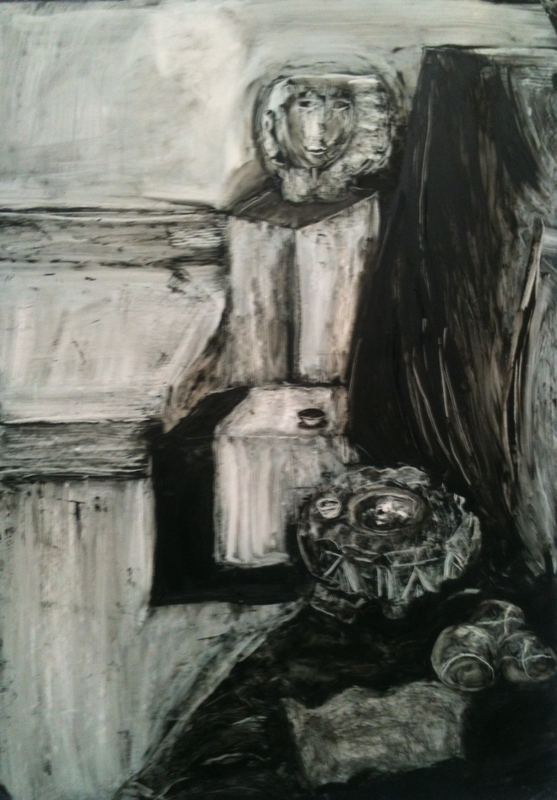 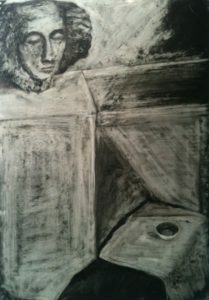 The still life combined found stones, carved heads by Roland Bean, a stone font, autumn leaves, other objects – a jug of water, candles and a dish of anointing oil. 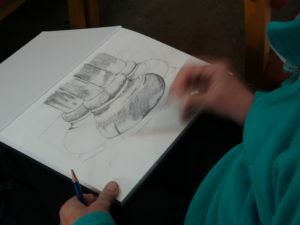 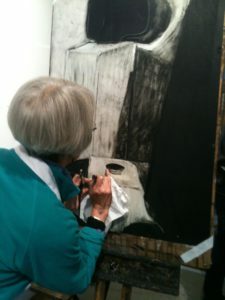 The class began with a discussion on the possible symbolism that each individual object or related objects suggested. 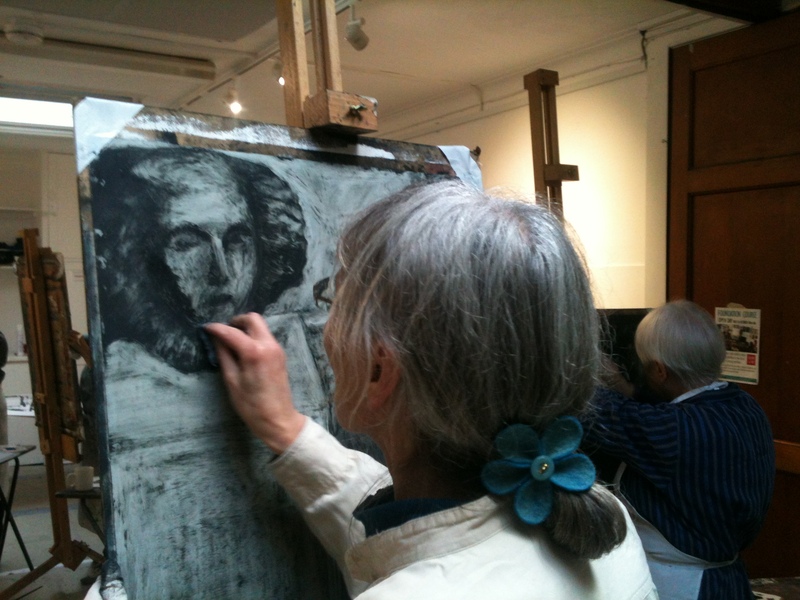 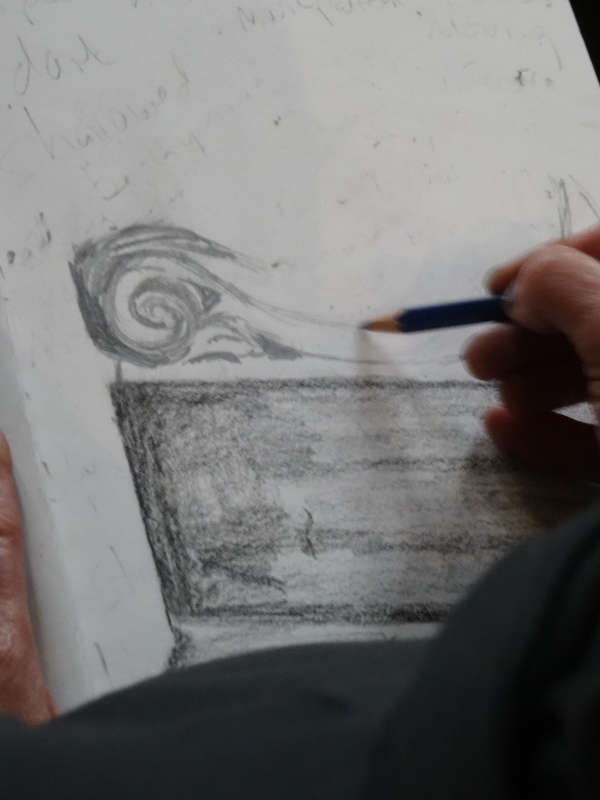 The slide lecture considered artists from 17th Century Vanitas genre and Degas’s monopronts. The Art and Spirituality 16-17 class has begun. 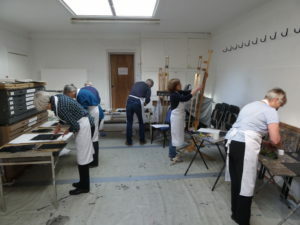 We are now two weeks in with an interesting and enthusiastic group of students. 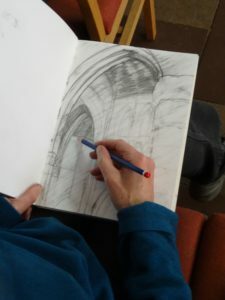 The Theme at LSA this year is ‘Landmarks’, taken from the book by Robert MacFarlane. 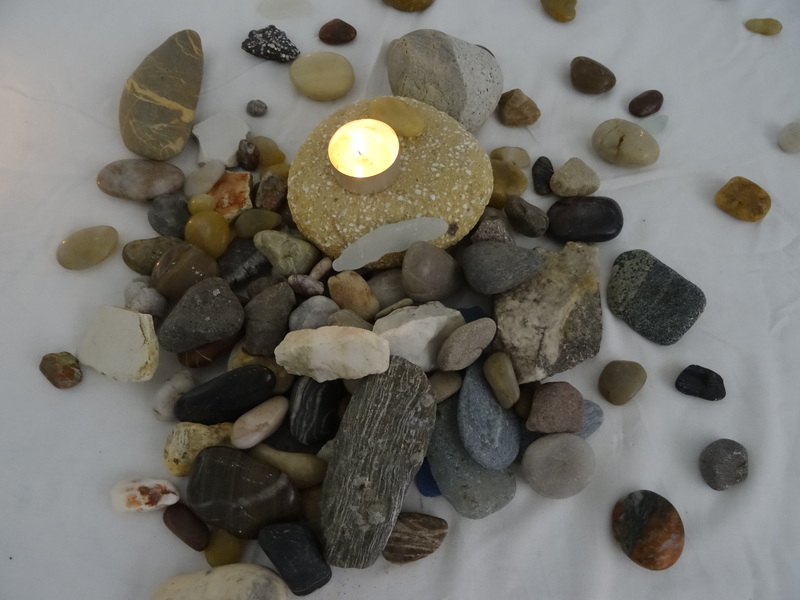 We began with a meditation of images considering and reflecting on the many landmarks that are made or represented by stones, their possible metaphors and symbolism. 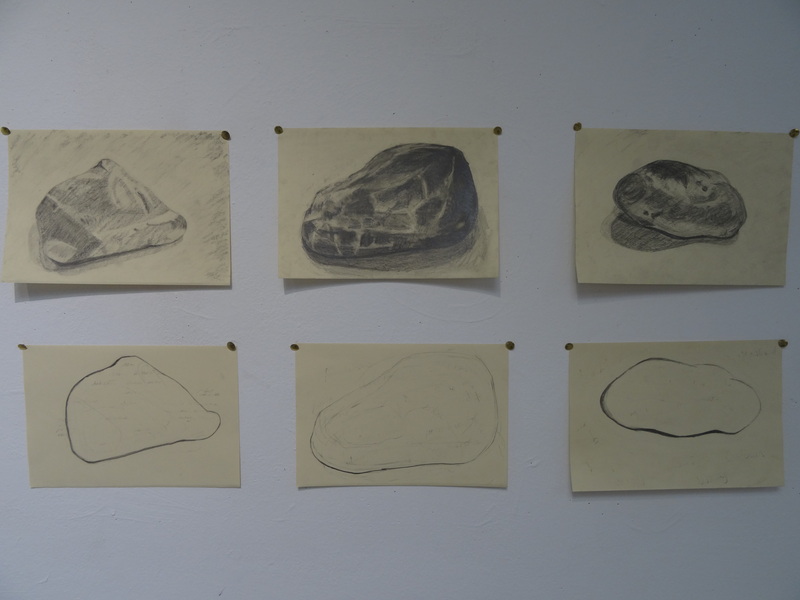 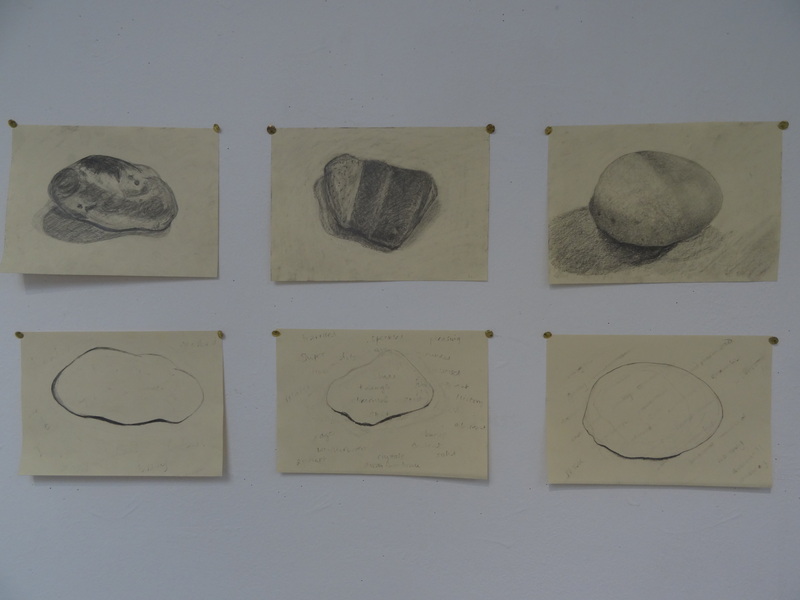 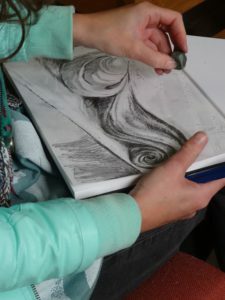 We began simply by drawing stones – ones that had been brought by the group form favorite places, found on walks and pocketed for their beauty – looking intimately, trying to get to know the ordinary yet extra-ordinary small part of creation in front of us. 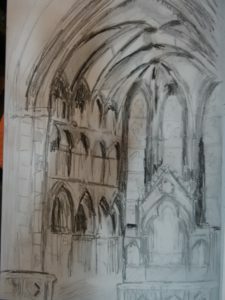 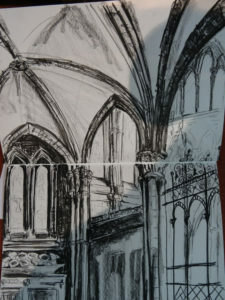 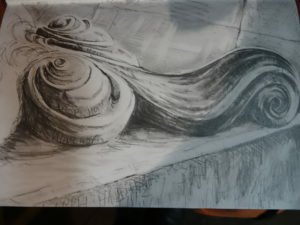 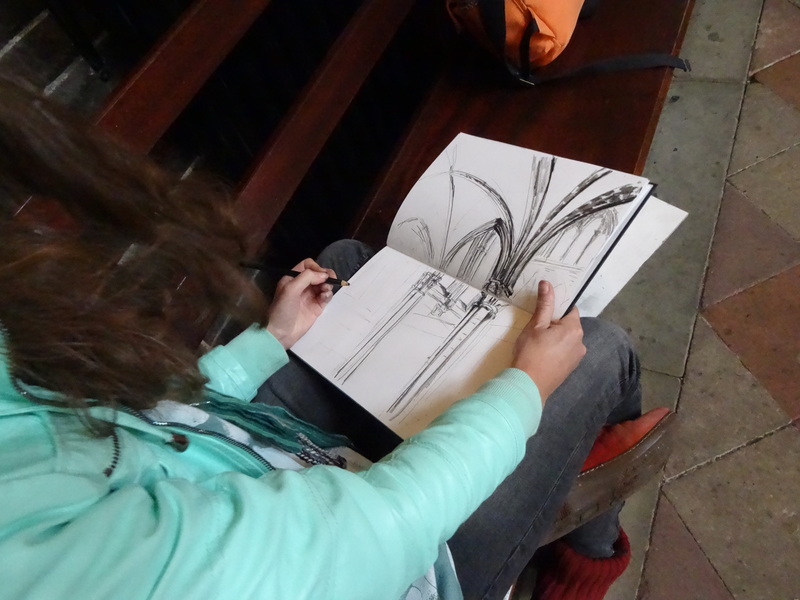 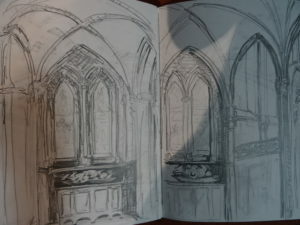 In week two we visited St. Mary’s Episcopal Cathedral to enjoy the beautiful exhibition by Monica Guggisberg & Philip Baldwin and explore the cathedral stone and space through drawing in our sketchbooks.